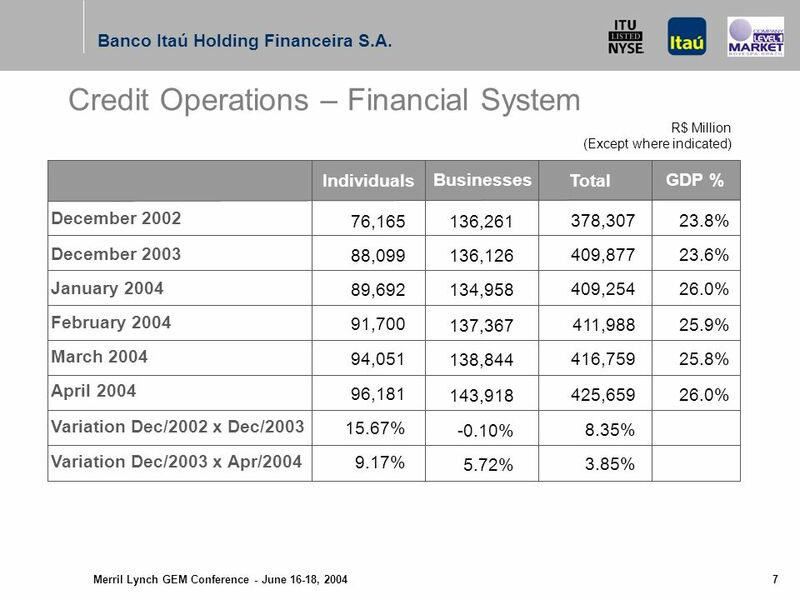 Merril Lynch GEM Conference - June 16-18, 2004 June 16-18, 2004 Presentation to: Global Emerging Markets Conference Banco Itaú Holding Financeira S.A.
9 Merril Lynch GEM Conference - June 16-18, 2004 8 Business Concentration on businesses with a greater spread Credit Personal credit: consortium, credit cards and vehicle financing Small Business: Retail - UPJ and Middle Market Dilution of Business Risk and Diversification Treasury Equilibrium between Private and Public Securities High level of capitalization New opportunities Acquisitions of New Businesses Share Buyback Program Dividends Focus on Profitability Insurance, Capitalization and Private Pension Plans Emphasis on Life and Pension Plans Market leader in home insurance International Presence (US$ 2.4 bi) New London Branch Financing of Brazilian companies overseas Support for Trade Finance operations Banco Itaú Holding Financeira S.A.
10 Merril Lynch GEM Conference - June 16-18, 2004 9 Controls Cost Reduction/ Administrative Expenses Zero Base Budget Internal Campaign: How much does it Cost? 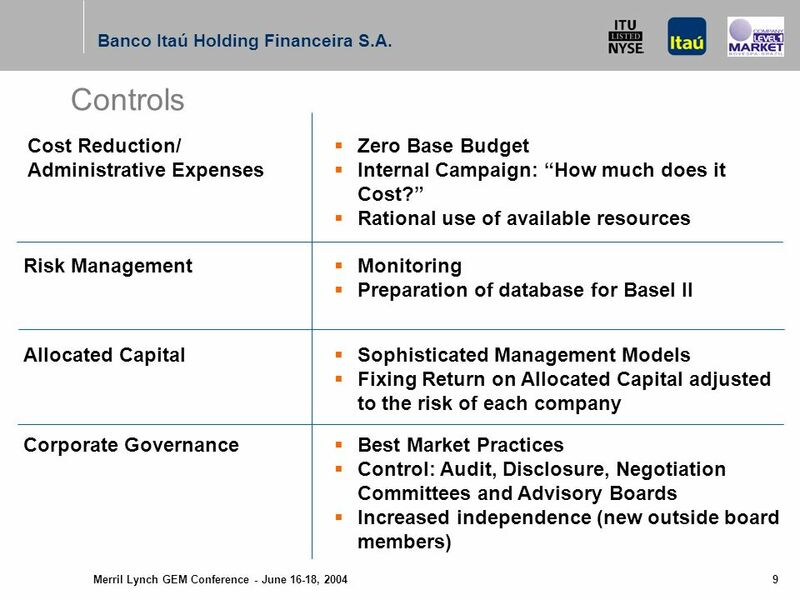 Rational use of available resources Risk Management Allocated Capital Corporate Governance Monitoring Preparation of database for Basel II Sophisticated Management Models Fixing Return on Allocated Capital adjusted to the risk of each company Best Market Practices Control: Audit, Disclosure, Negotiation Committees and Advisory Boards Increased independence (new outside board members) Banco Itaú Holding Financeira S.A.
13 Merril Lynch GEM Conference - June 16-18, 2004 12 Financial Ratios Banco Itaú Holding Financeira S.A.
19 Merril Lynch GEM Conference - June 16-18, 2004 18 (*) Provision Balance / Total Nonperforming Loans Nonperforming Loans and Coverage Ratio Banco Itaú Holding Financeira S.A.
22 Merril Lynch GEM Conference - June 16-18, 2004 21 59.5% 55.0% 48.2% 54.1% Not considering the 4th Q./02 and 1st Q./03, since we consider this criteria indicates better the recurrent efficiency. 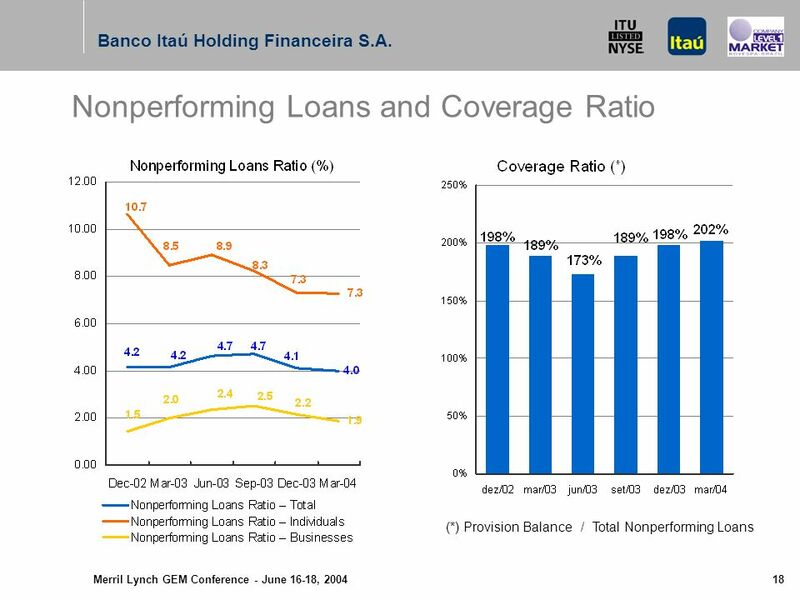 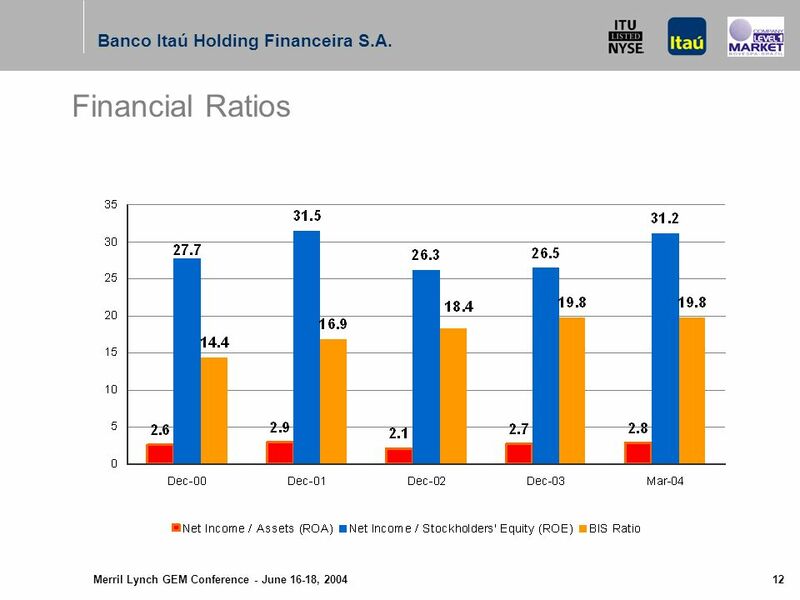 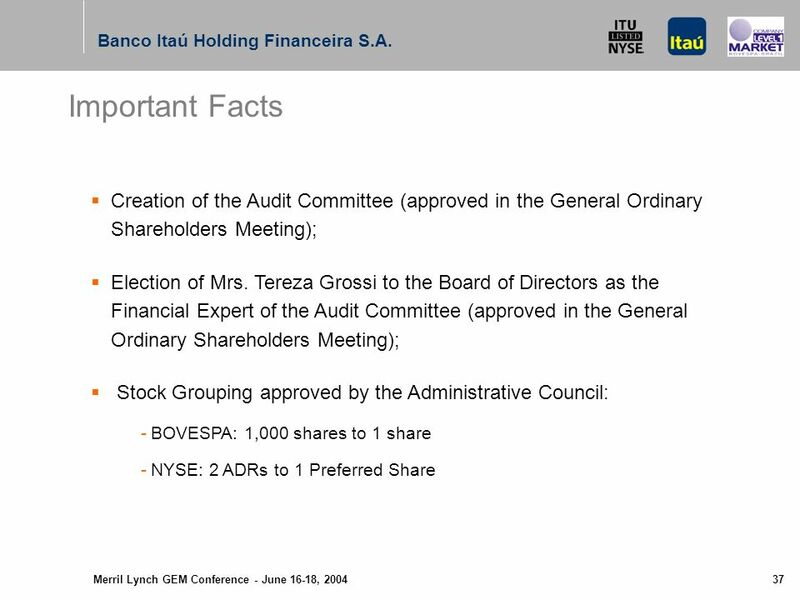 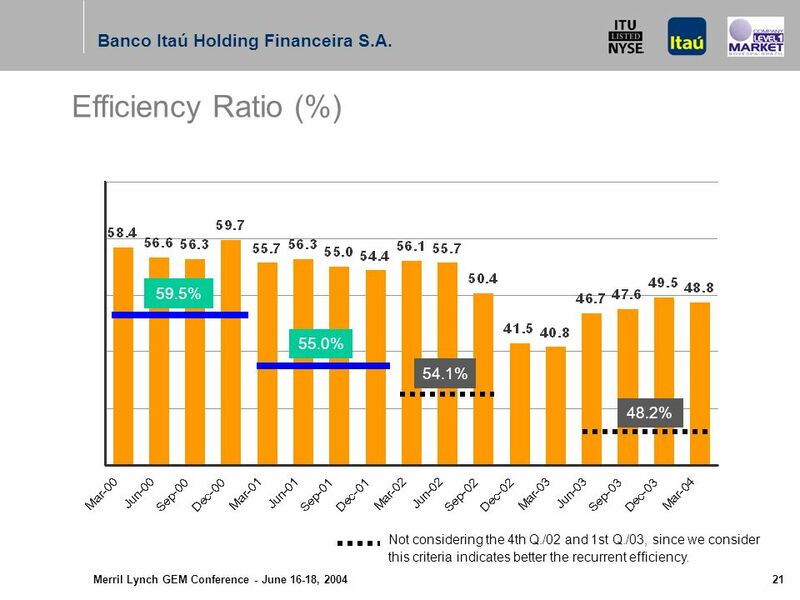 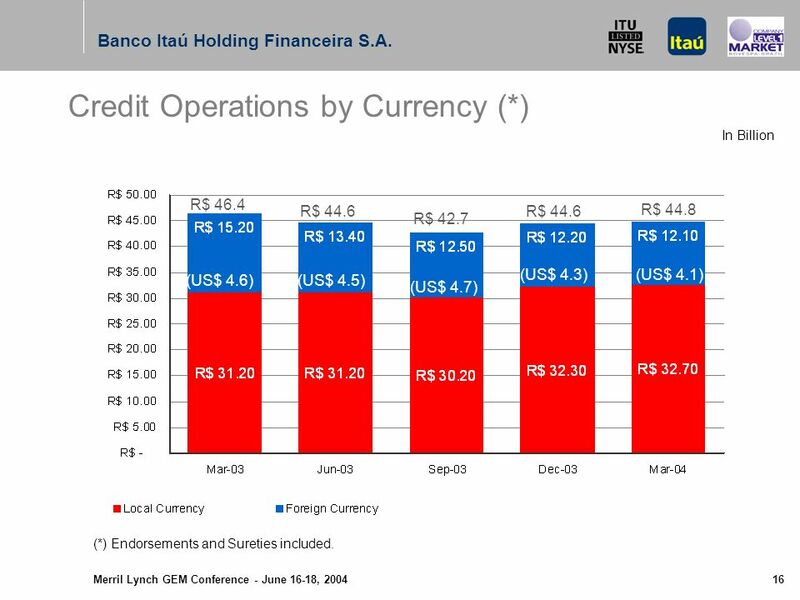 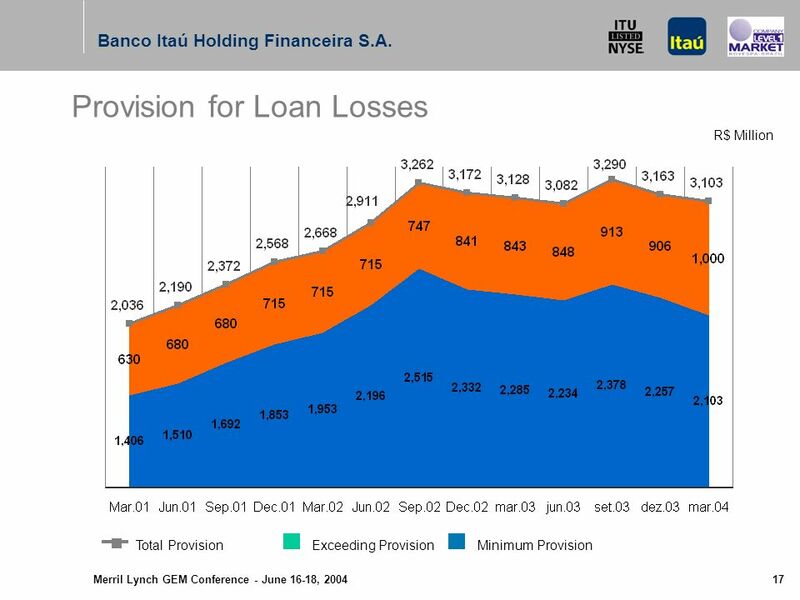 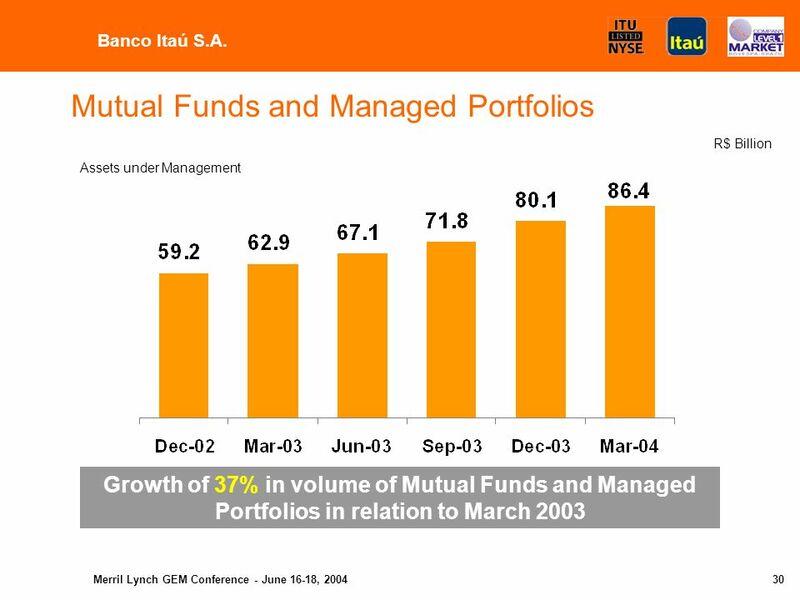 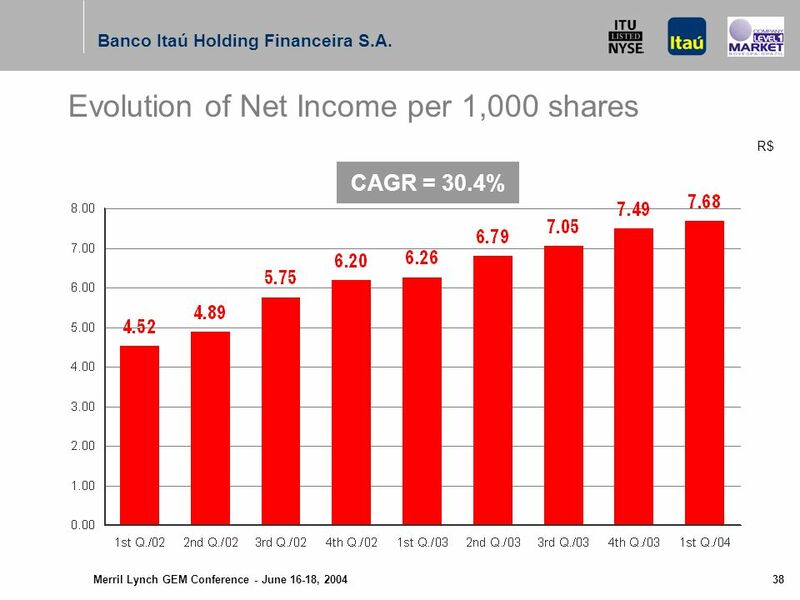 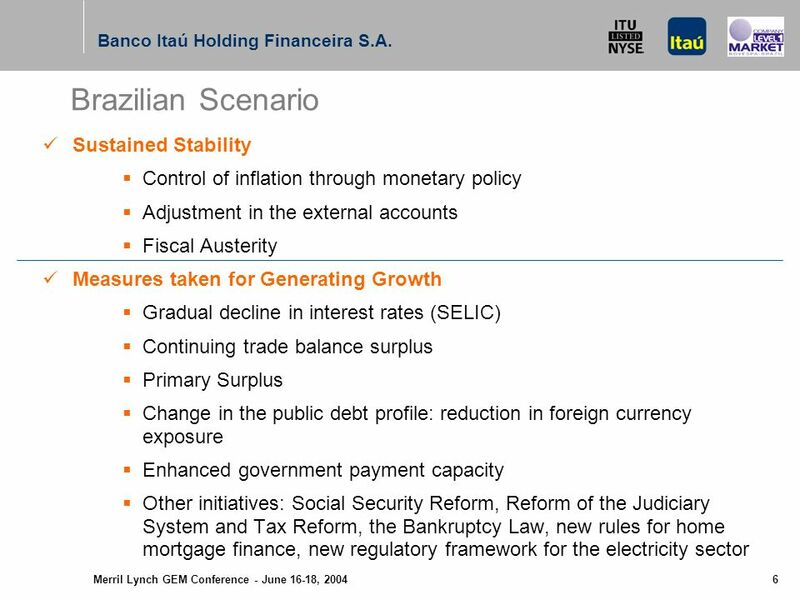 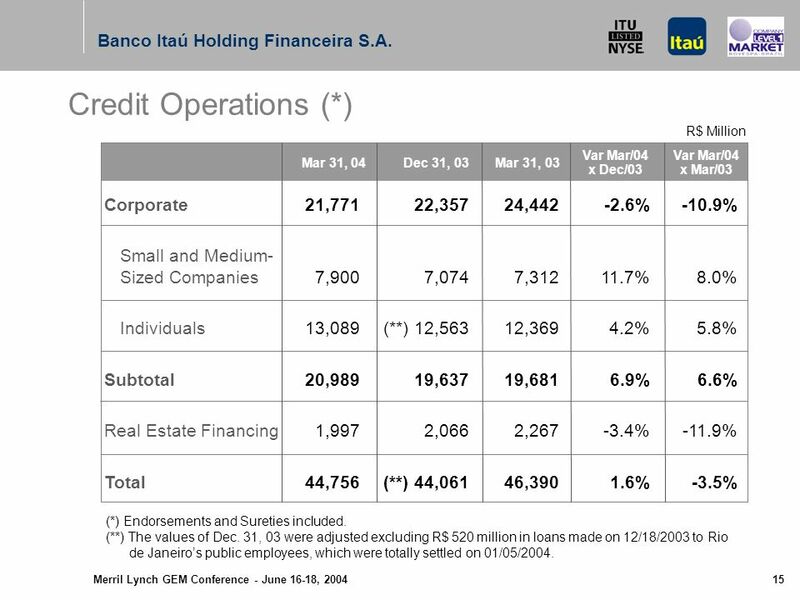 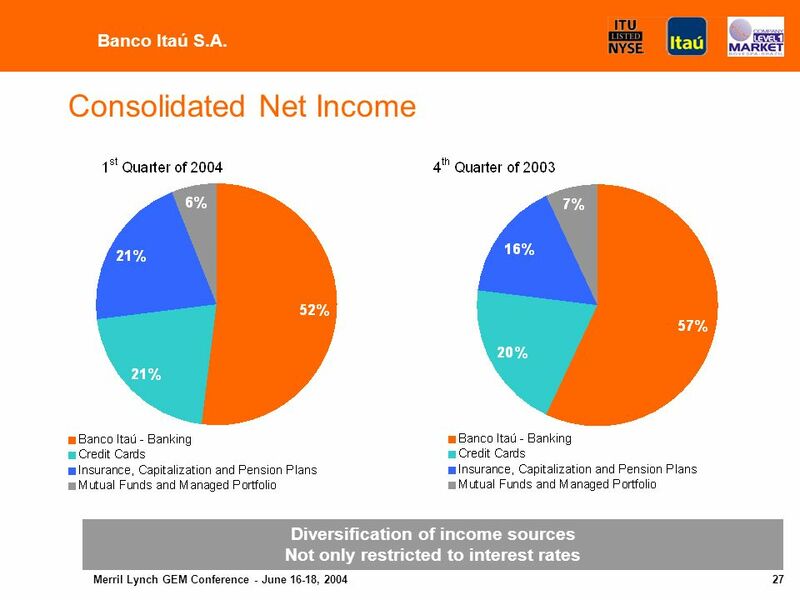 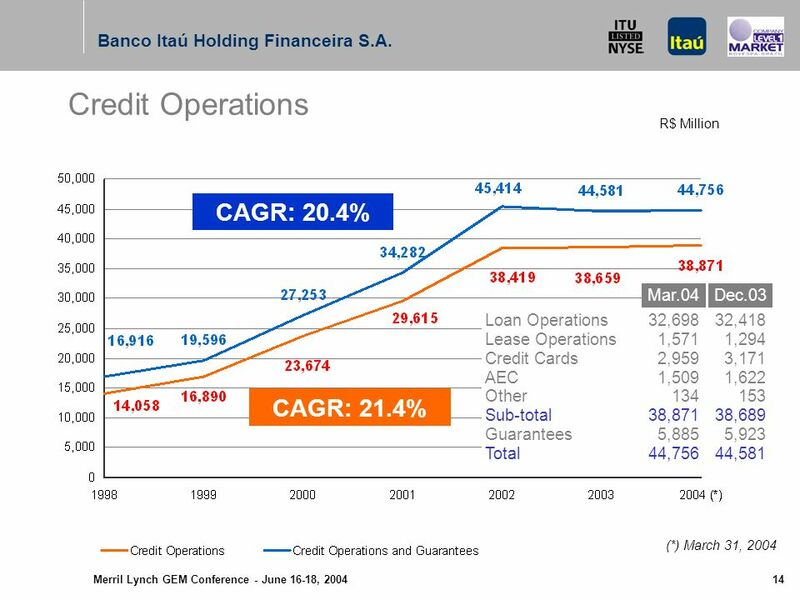 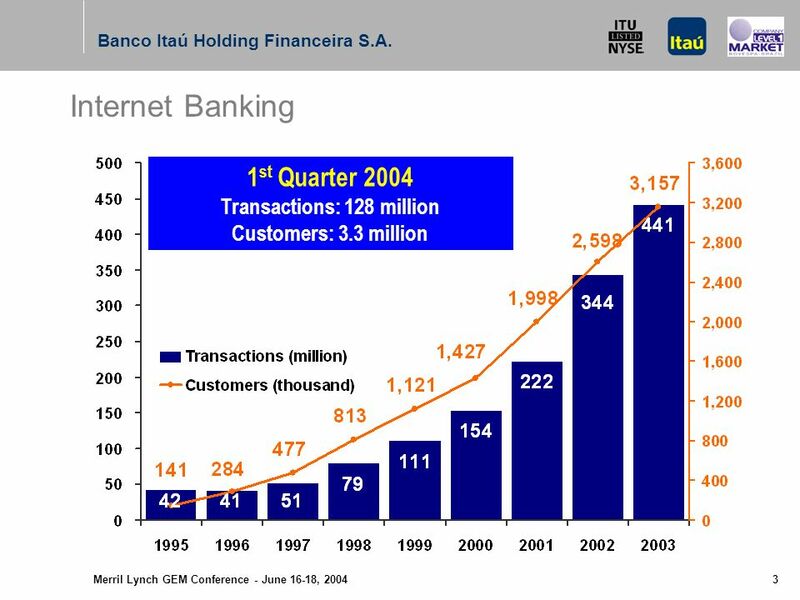 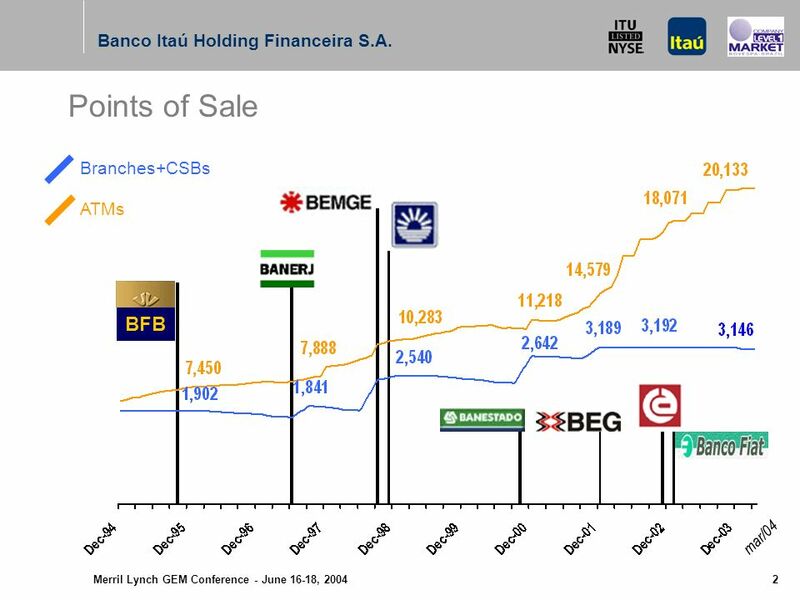 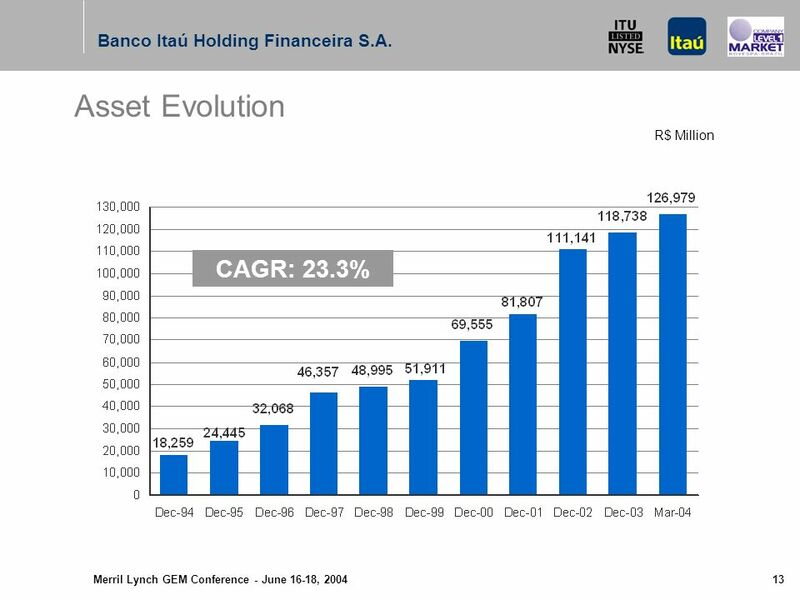 Efficiency Ratio (%) Banco Itaú Holding Financeira S.A.
23 Merril Lynch GEM Conference - June 16-18, 2004 22 Total Unrealized Interbank Deposits Securities and Derivatives Exceeding Provision Adjust. 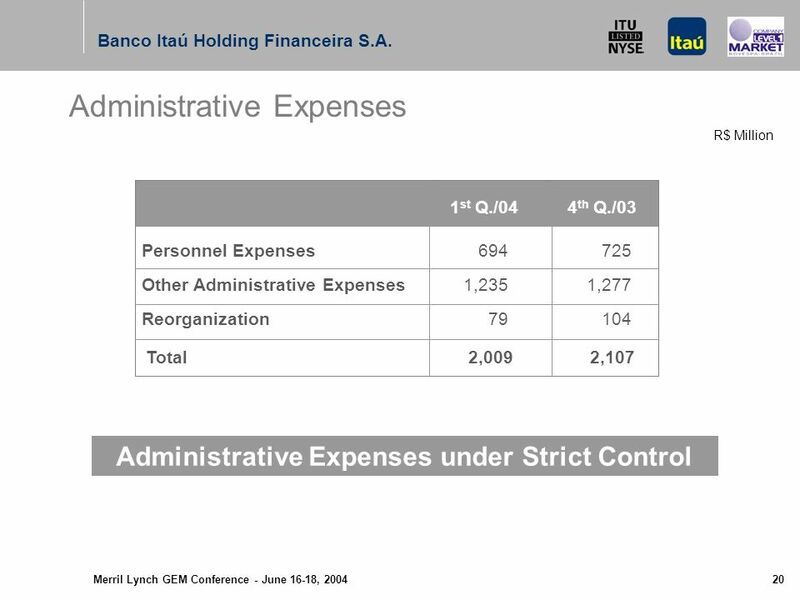 of Securities Available for Sale Adjust. 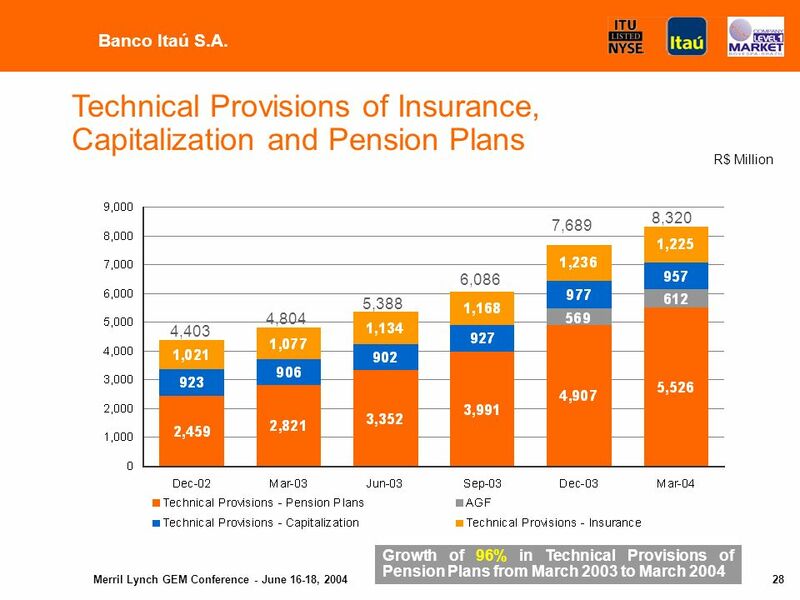 of Securities Held to Maturity Credit Operations Investments (basically in BPI) Time and interbank dep. 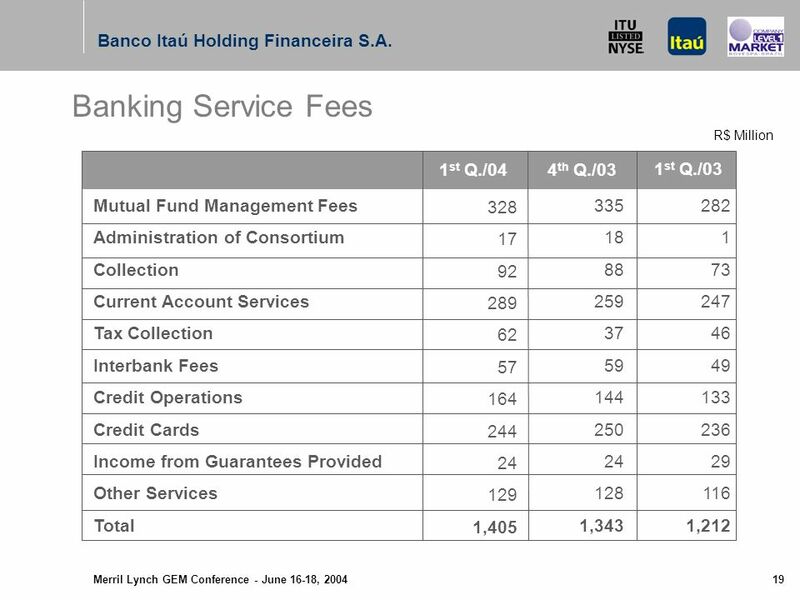 and funds from accept. 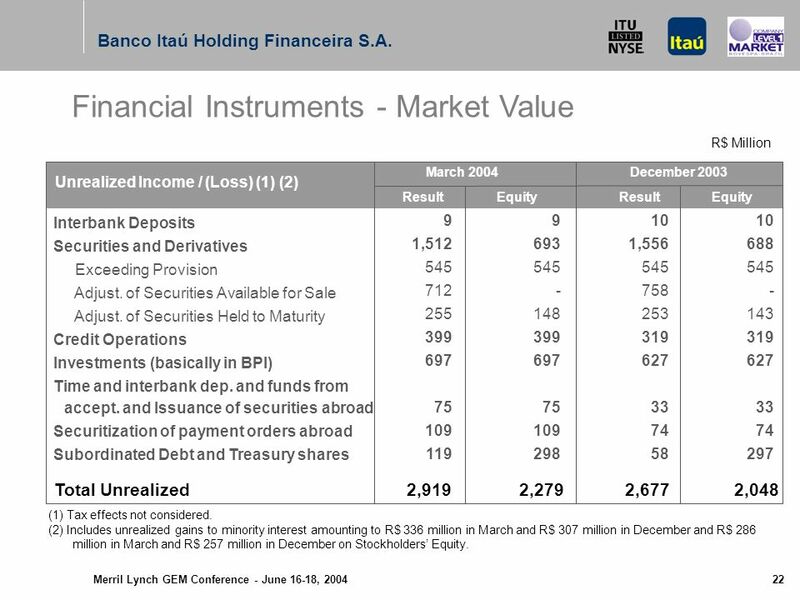 and Issuance of securities abroad Securitization of payment orders abroad Subordinated Debt and Treasury shares Unrealized Income / (Loss) (1) (2) ResultEquity March 2004 2,9192,279 9 1,512 545 712 255 399 697 75 109 119 9 693 545 - 148 399 697 75 109 298 ResultEquity December 2003 2,6772,048 10 1,556 545 758 253 319 627 33 74 58 10 688 545 - 143 319 627 33 74 297 (1) Tax effects not considered. 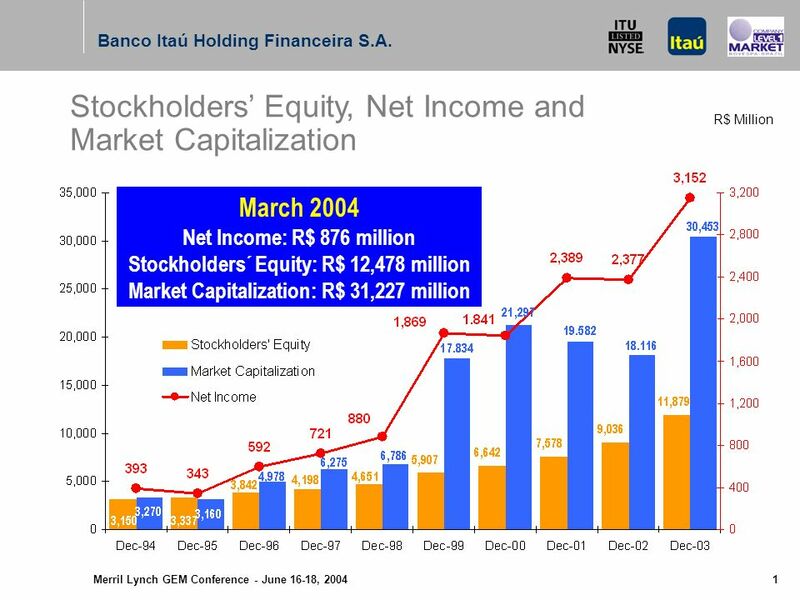 (2) Includes unrealized gains to minority interest amounting to R$ 336 million in March and R$ 307 million in December and R$ 286 million in March and R$ 257 million in December on Stockholders Equity. 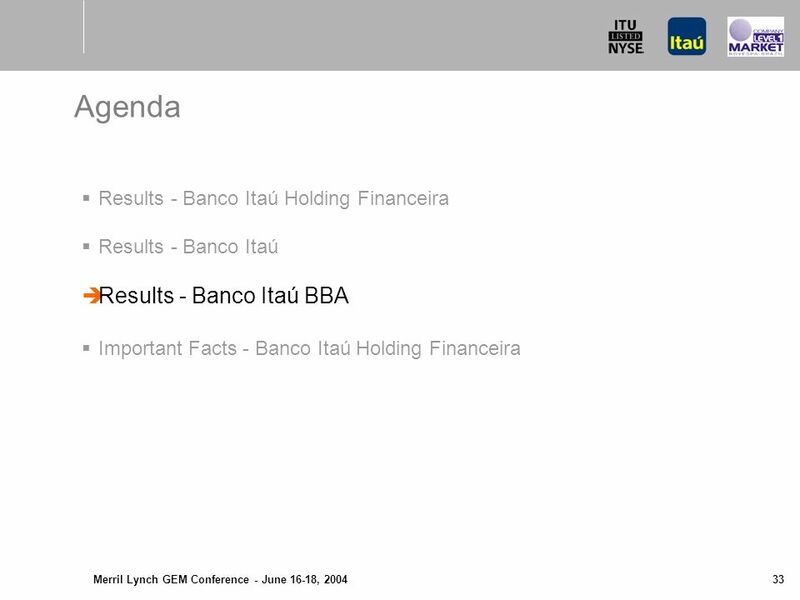 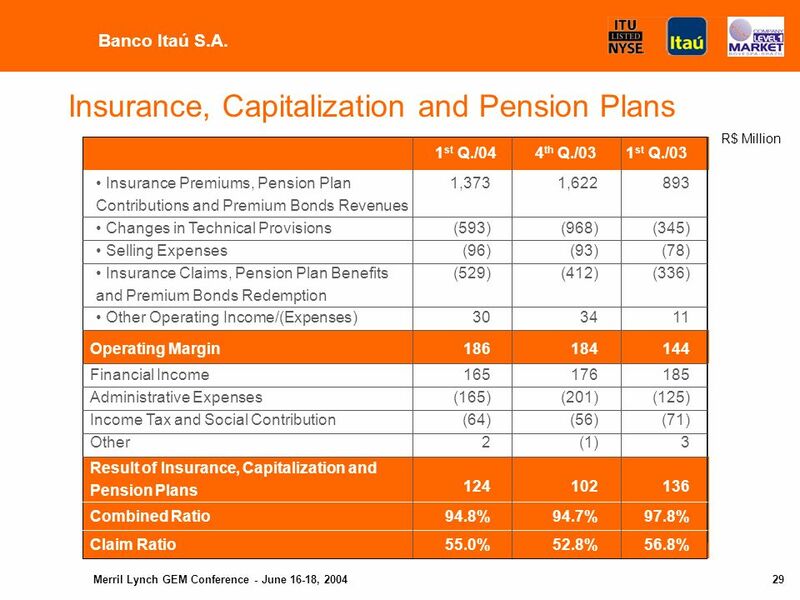 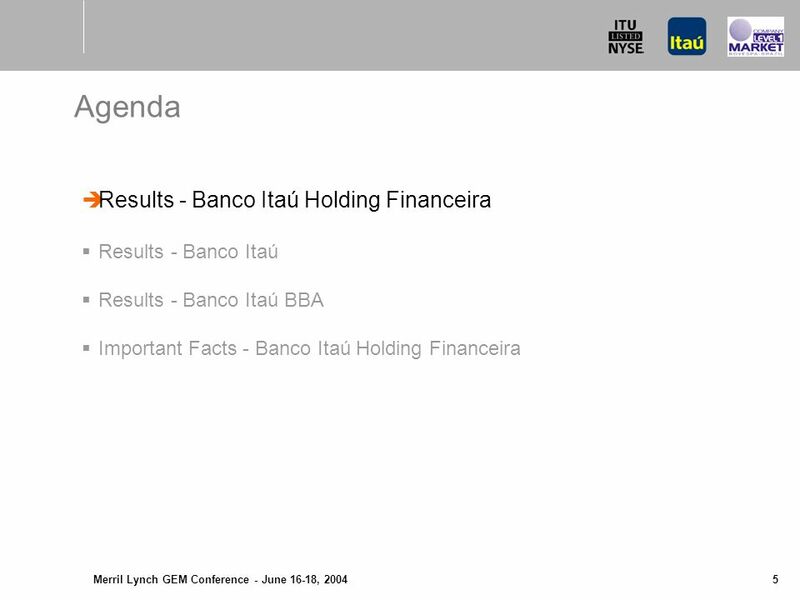 Financial Instruments - Market Value R$ Million Banco Itaú Holding Financeira S.A.
24 Merril Lynch GEM Conference - June 16-18, 2004 23 The following slides show the pro forma information about Banco Itaú and Banco Itaú BBA operations, using internal data for a better disclosure of the managerial performance of the business units. 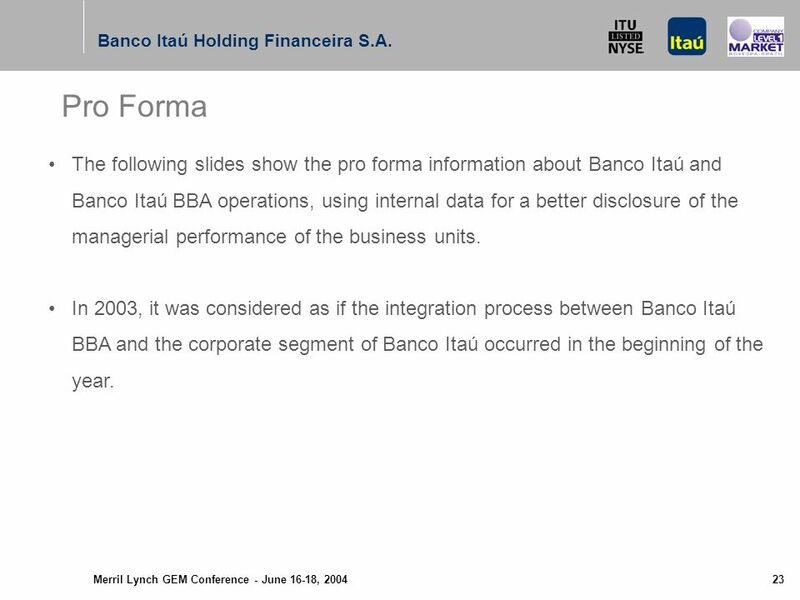 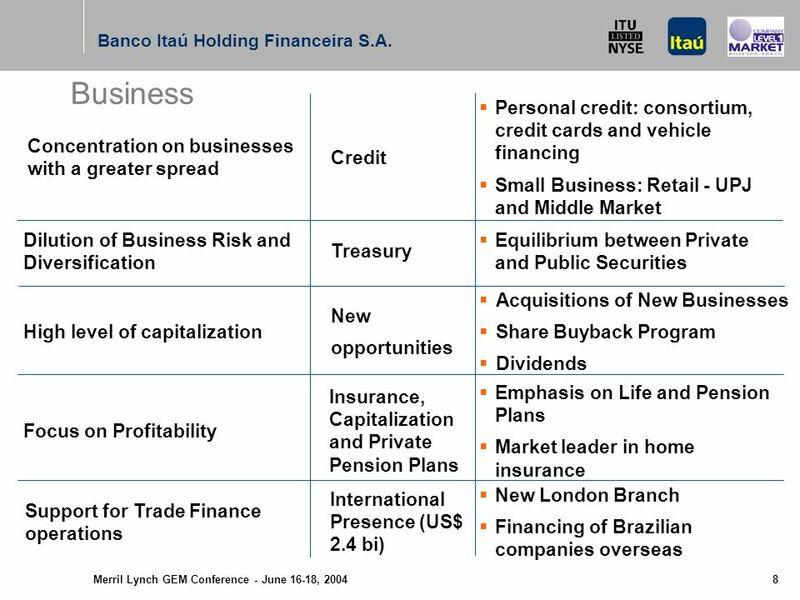 In 2003, it was considered as if the integration process between Banco Itaú BBA and the corporate segment of Banco Itaú occurred in the beginning of the year. 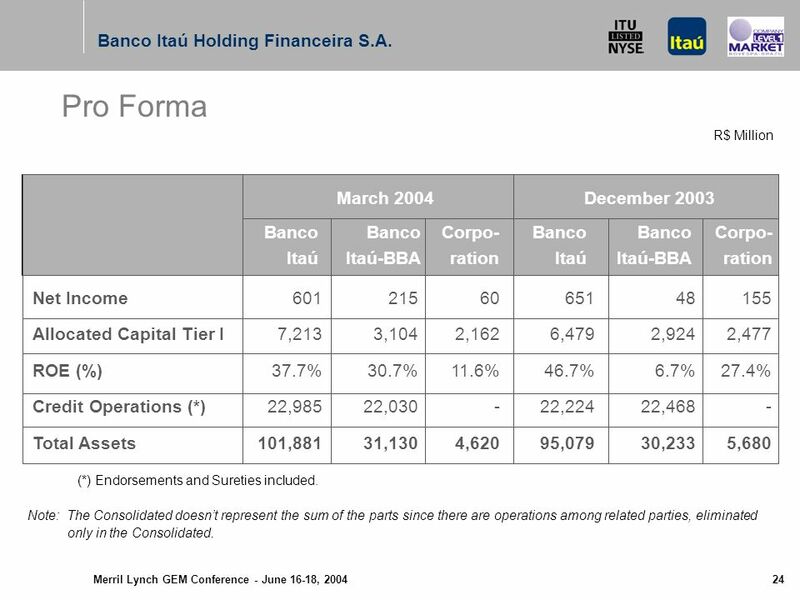 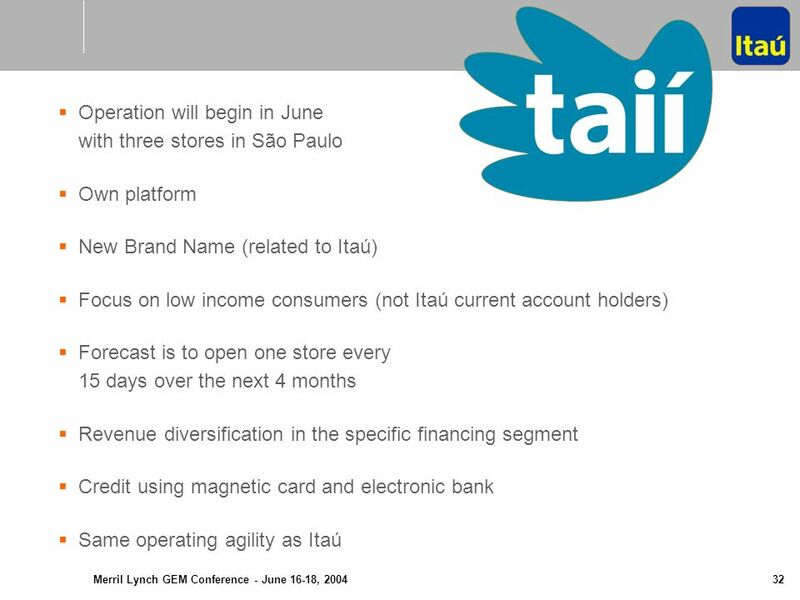 Pro Forma Banco Itaú Holding Financeira S.A.
25 Merril Lynch GEM Conference - June 16-18, 2004 24 Banco Itaú 601 7,213 37.7% 22,985 101,881 Banco Itaú-BBA 215 3,104 30.7% 22,030 31,130 Net Income Allocated Capital Tier I ROE (%) Credit Operations (*) Total Assets Banco Itaú 651 6,479 46.7% 22,224 95,079 Banco Itaú-BBA 48 2,924 6.7% 22,468 30,233 March 2004December 2003 (*) Endorsements and Sureties included. 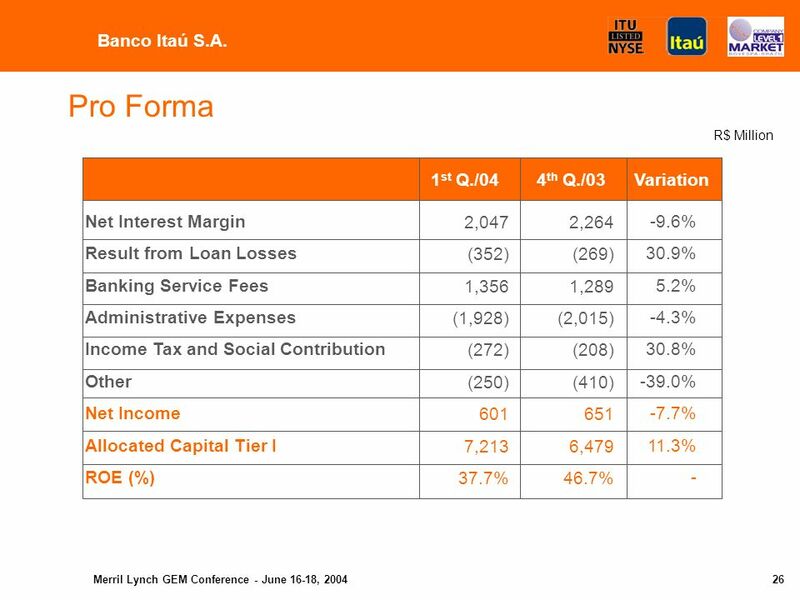 Banco Itaú Holding Financeira S.A. R$ Million Pro Forma Corpo- ration 155 2,477 27.4% - 5,680 Corpo- ration 60 2,162 11.6% - 4,620 Note: The Consolidated doesnt represent the sum of the parts since there are operations among related parties, eliminated only in the Consolidated. 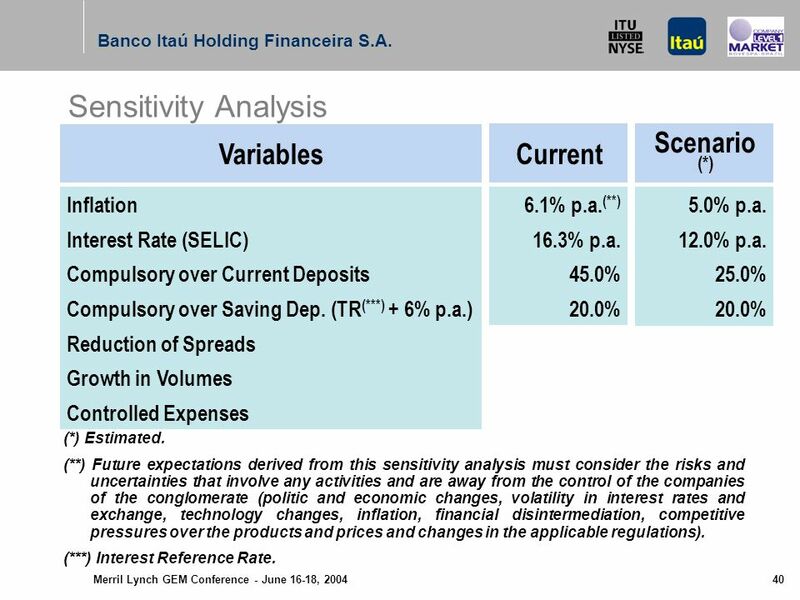 41 Merril Lynch GEM Conference - June 16-18, 2004 40 Variables Inflation Interest Rate (SELIC) Compulsory over Current Deposits Compulsory over Saving Dep. 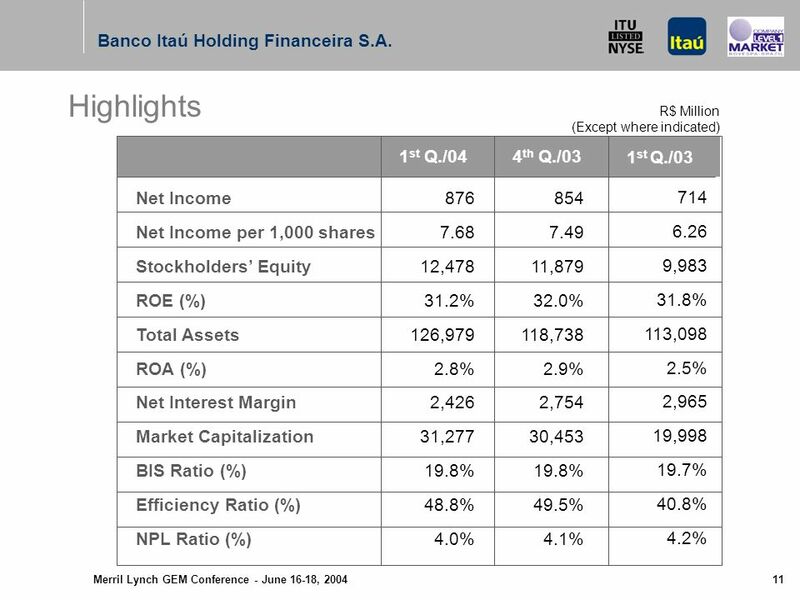 (TR (***) + 6% p.a.) 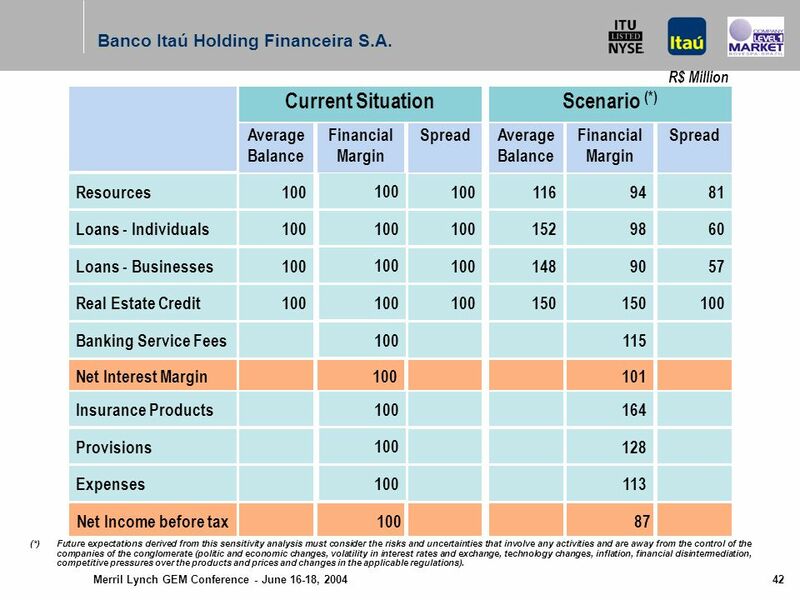 Reduction of Spreads Growth in Volumes Controlled Expenses Scenario (*) 6.1% p.a. 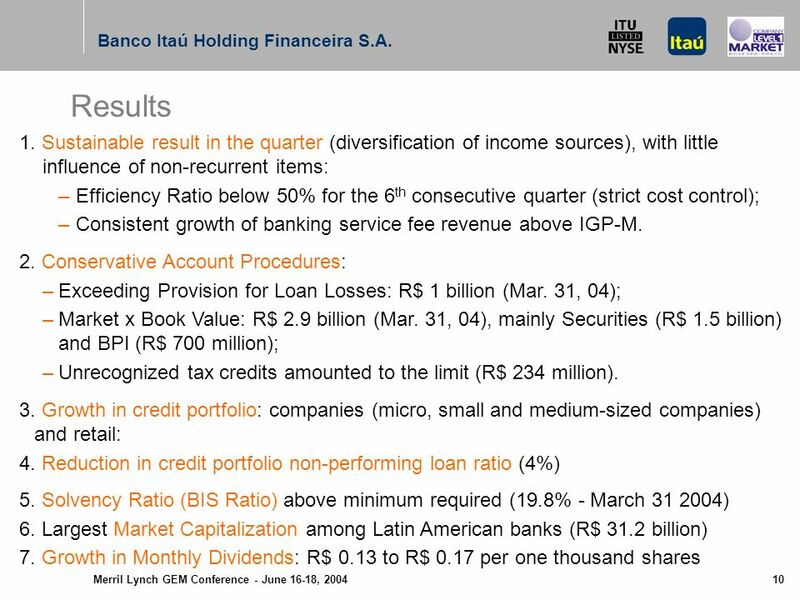 (**) 16.3% p.a. 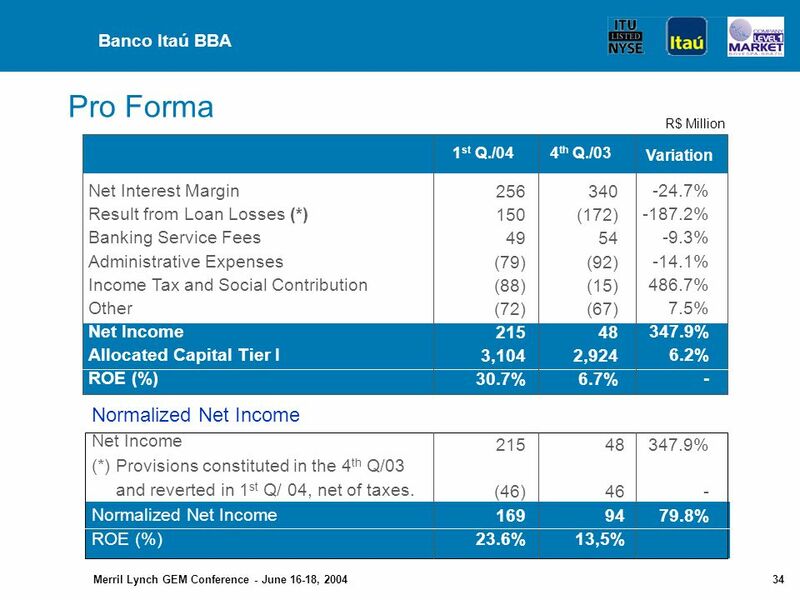 45.0% 20.0% Current 5.0% p.a. 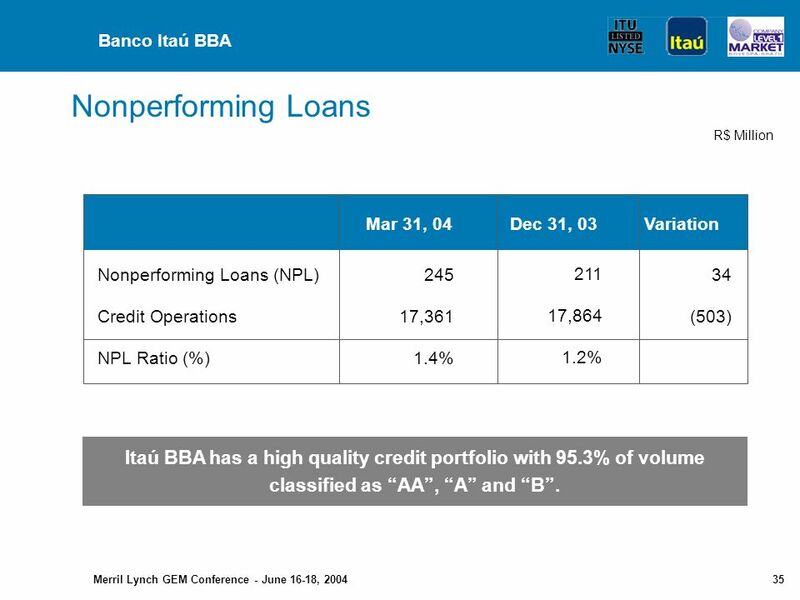 12.0% p.a. 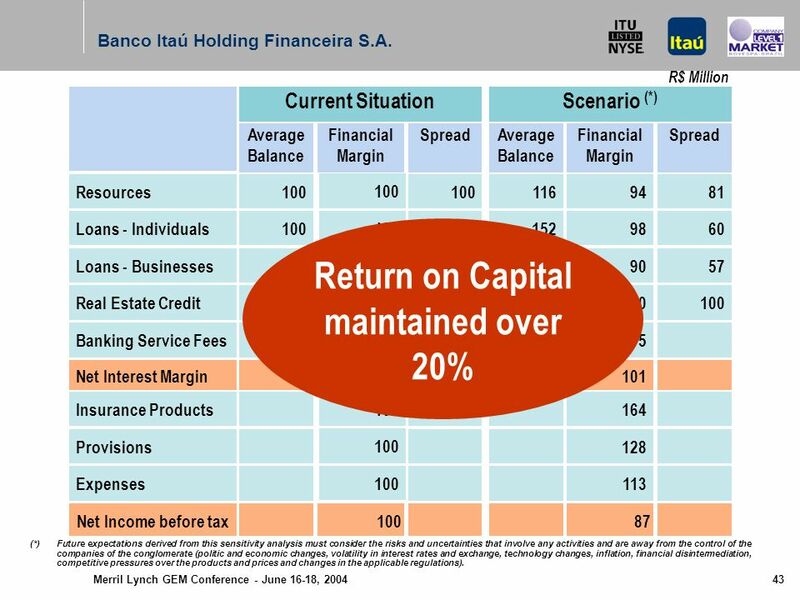 25.0% 20.0% (**) Future expectations derived from this sensitivity analysis must consider the risks and uncertainties that involve any activities and are away from the control of the companies of the conglomerate (politic and economic changes, volatility in interest rates and exchange, technology changes, inflation, financial disintermediation, competitive pressures over the products and prices and changes in the applicable regulations). 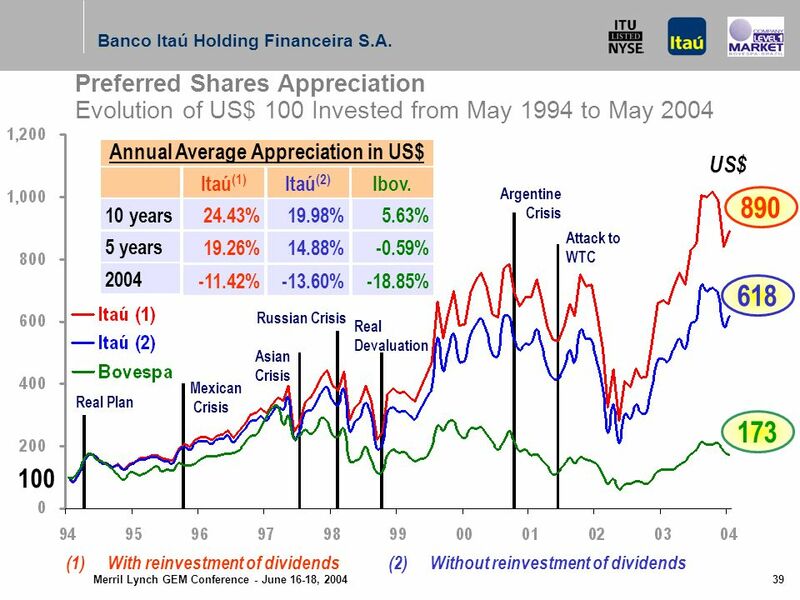 (***) Interest Reference Rate. 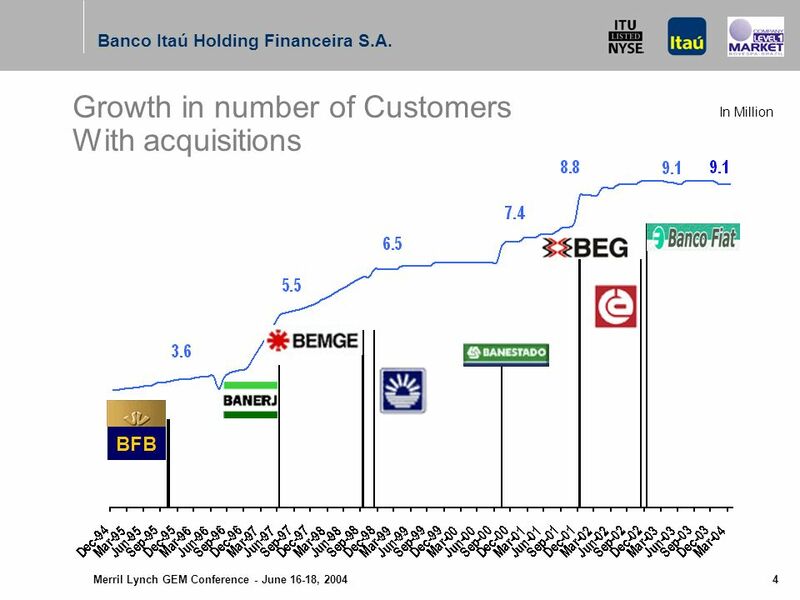 Banco Itaú Holding Financeira S.A. 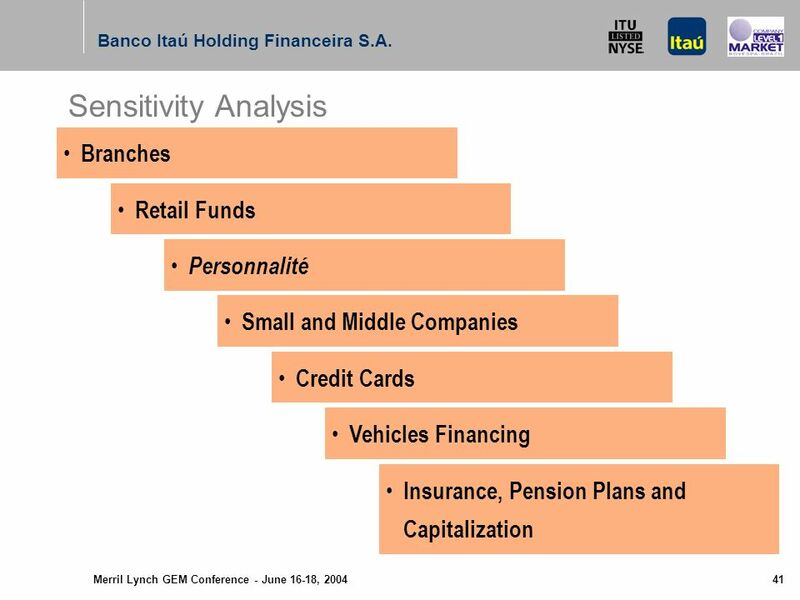 Sensitivity Analysis (*) Estimated. 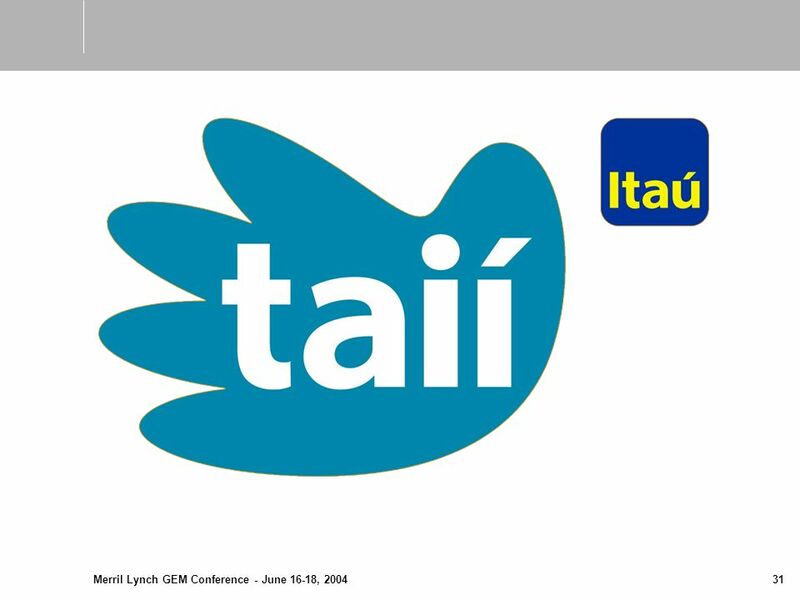 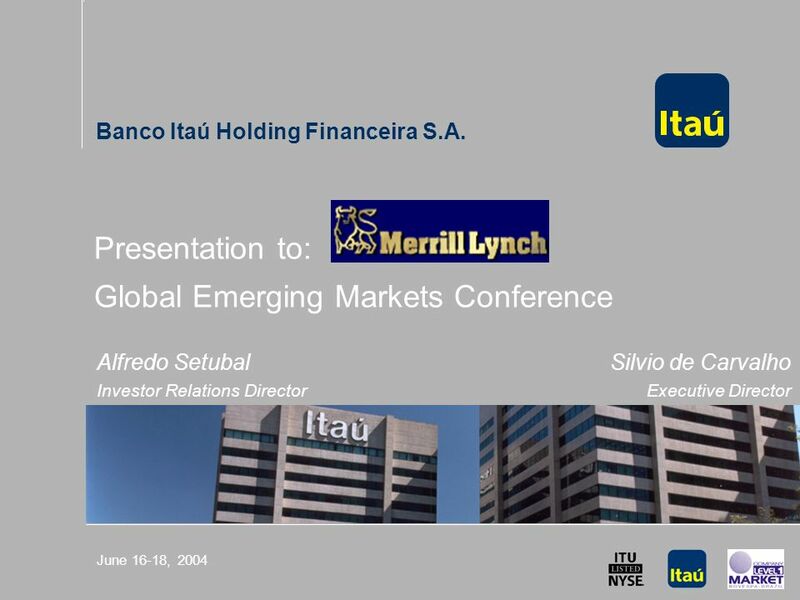 Download ppt "Merril Lynch GEM Conference - June 16-18, 2004 June 16-18, 2004 Presentation to: Global Emerging Markets Conference Banco Itaú Holding Financeira S.A."
Conference Call Results of the 3rd Quarter/2006 November 1, 2006.